Slice zucchini into 1/4 inch thick slices. Sprinkle each slice lightly with salt, and place in a colander for 30 minutes. This causes the excess moisture to come to the surface and drip off. Although not essential, this makes for a firmer dish in the end. Dip each slice first in eggs, then into crumbs. Add oil to a large saute pan over medium-high heat. 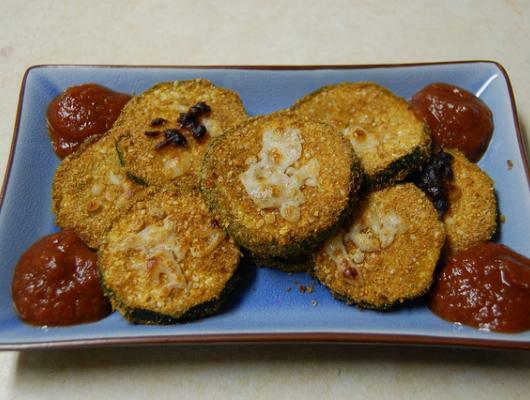 Saute zucchini in oil until golden brown on both sides. 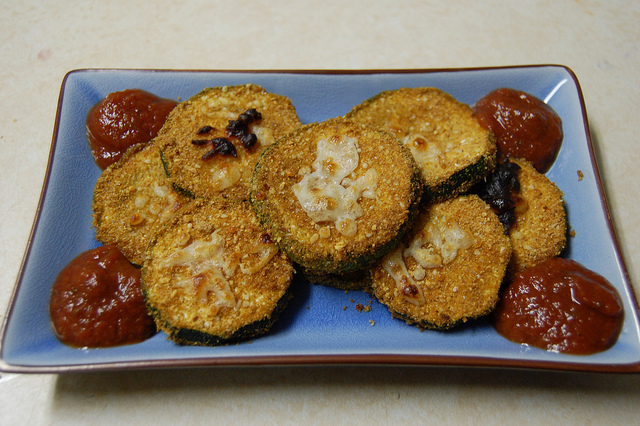 Place one layer of breaded zucchini in a 2 quart casserole; sprinkle with Parmesan cheese and mozzarella then cover with tomato sauce. Repeat with the rest of the zucchini and cheese to the top. Bake uncovered in preheated 350F oven for 30 minutes or until sauce is bubbly and cheese is melted. Preheat oven at 350 degrees, and use the time to prepare the slices. Once they are ready, your oven will be hot!